At Summit GM, our goal is to make your car buying experience the very best possible, from start to finish. Our online inventory offers a huge variety of new and used cars, trucks and SUVs. You’ll also find a great offering of Chevrolet, Buick, GMC service specials and maintenance services. Summit GM is proud to be a member of the Kaizen Automotive Group family. The success offering high quality vehicles and excellent customer service to our community is apparent, with Kaizen expanding to eight other locations in the Alberta area. The worst experience ever!!! Buyers BEWARE! Shopped for a vehicle In September 2018. Couldn't get the right approval i wanted. I drove to Edmonton, and had zero problems with what i wanted at a much lower price. I came back to summit Fort McMurray to trade my car off for a SUV, and was given the run around for a week!! That is why you shop in Edmonton Folks. "Worst service you will ever receive "
You won’t get a rental for their shop incompetence, you won’t get any friendliness or help and you won’t get any service once you’ve bought the car. How on earth is it ok to make someone go without a car because you can’t get an appointment fast enough and then once we do get in first thing in the AM from said appointment nobody calls me until 5pm saying it hasn’t even gone in and needs to stay the weekend. For a 2 hour repair job?! Normally this would be fine as EVERY dealership I’ve dealt with would give you a rental or loaner for the time being. Here? Hah, good luck. They’ll tell you it’s your problem now. What a joke of a dealership. Absolutely ZERO above and beyond service. 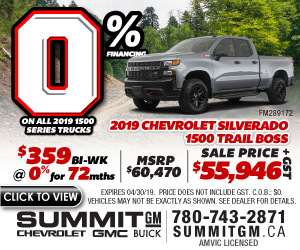 "Best dealership in Fort McMurray "
Just bought are 3rd and 4th vehicles from Summit. Huge thanks to Corey and Myron in sales. They did everything we asked for and never once where we disappointed. They are very knowledgeable with vehicles.Also Kim and Dave in finance. So happy with are purchases exactly what we where looking for. The perfect truck for me and the perfect suv for my wife. Best deal we could find anywhere in Northern Alberta. We will recommend Summit to all are friends, coworkers and family. Thanks again to everyone at Summit great job.